The PRESENSYA Art Collection is inspired by faces and emotions. The works talk about relationship, love, personal issues, family and religion. It is the first solo art exhibit of Mr. Ron Katagiri thus announcing his presence (Presensiya) as a painter and a visionary. It’s a compelling set of paintings produced by the artist’s imagination of how he interprets people’s emotions and issues on love and relationship. The works on the exhibit can be interpreted in so many ways relating to its audience. It can be classified as a mix of contemporary, abstract, pop art and portraiture with its color choice and techniques used. The basic medium is oil on canvas where subjects can be described as poetic and imaginative. The exhibit is organized by 777 Media Forum with its curator, Denver Trinidad, targeting a market of art enthusiasts who can best appreciate an art of its kind. It will feature 15 paintings created by JapaneseAdobo artist, Ron M. Katagiri. The painting works can be defined as an intense observation of the world surrounding us with deep appreciation of the beauty of the vernacular, faith and love in an intuitive expression permeating through the canvas. 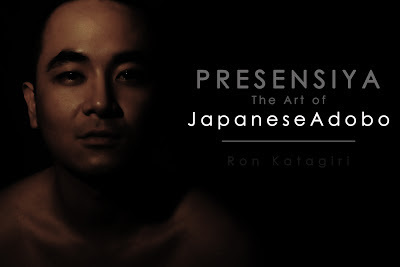 As the artist, Ron Katagiri, believes that everything is art and everyone is an artist. Every piece of art work is priceless as the artist pours his emotions through the works. Not to impress but to simply express the instinctive form of conceptualization and imagination in a given work. Ron interprets a painting like a song where he is the composer and the audiences are the singers. Each viewer has their own individuality thus interpretation of the work. It can be mostly related to personal experiences or emotions capturing the individual’s deepest soul illustrated on a canvas. Ron Katagiri started out as a hobbyist doing paintings as gifts to his closest friends. Later on, people began consigning him to do art works for their own houses or offices. Ron, being a writer, song composer, graphic artist and bag designer has been closely linked to producing oil paintings because of his passion to express his own thoughts and emotions in every artistic way he could. From a simple blogger to becoming a writer, an illustrator to a painter, graphic artist to a bag designer; this talented artist is sure to prove more in terms of pouring out his emotions through art. PRESENSIYA: The Art of JapaneseAdobo is made possible by the generosity of its sponsors Mr. Paul Mercado, Mr. Denver Trinidad and Mr. Bobby Joseph (Owner of the venue: The Wine Museum). It will be a month long exhibition of the 15 works of Ron Katagiri starting on its opening night on January 24, 2013 6:00PM. It will be a strictly invitational party for the VIP guests and press people celebrating the artistry of JapaneseAdobo on its first solo exhibition. The catalogue will feature the works of the artist, Ron Katagiri, for the exhibit Presensiya and some photos of other works done over the years. It will be accompanied by essays descriptions and interpretation of the works on the artist’s perspective. I hope so. Thank you!! !